← If only Ralph Nader had become President in 2000? Oh, Rachel and Reuben, what a lovely world this would be…. Barefoot Accountant: I would like to thank you for giving me the opportunity to interview you. I saw you on the Cenk Uygur’s show, The Young Turks, last December in 2010, where you seemed to speak what most Americans want from their leaders but are not getting from the two political parties that are in power. I did become aware of the fact that Jon Stewart interviewed you, but I have never seen Wolf Blitzer or Chris Matthews interview you. Did Chris Matthews interview you yet, Rocky? 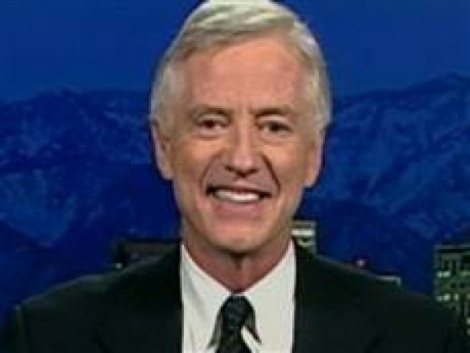 Rocky Anderson: I was interviewed by Chris Matthews but that was many years ago, and I think it was about the Olympics: that was when I was mayor of Salt Lake City. The same with Wolf Blitzer. Barefoot Accountant: That’s sad because it seems to perpetuate the two party system that we have; it doesn’t allow us to have a third voice. But other than Cenk Uygur, has anyone else from the major media interviewed you since you announced your candidacy for President? Rocky Anderson: Yes, I have been on CNN, MSNBC, RT Television; I was on with Amy Goodman on Democracy Now, Rachel Maddow, Chuck Todd. I actually had gotten quite a bit of good media coverage, especially right after I announced that I was running, but it’s not very consistent and it’s certainly not anywhere close to media treatment of the Republican and Democratic candidates, which I think is really unfortunate because although they are making it look like they are saying different things, neither of these candidates are talking about a change in the real fundamentals. Things like getting the corrupting influence of money out of our political system. And they are not likely to say that because they are benefitting tremendously from that. They have their hands out bringing in millions and millions of dollars weekly, and becoming beholden to those who are contributing to their campaigns in the meantime. It basically is a fact that Congress and the White House are basically on retainer to represent the interests of those who have contributed to their campaigns and who fund the lobbying blitzes that take place in Washington. And all the time the public interest is being shafted. My voice, and the voice of other third parties and independent candidates, has basically been censored by the system that has been so rigged by the two parties, even to the point where the two parties hijacked the Presidential debate away from the League of Women Voters: they formed their own Presidential Debate Commission, which makes it sound like that there is some kind of independence to it but the fact is that the Presidential Debate Commission is entirely organized and run by the dictates of the two dominant party candidates. Without the blessing of both the Republican and Democratic candidates, third-party or independent candidates are excluded – all further eroding any semblance of our democracy. Once again, the king-makers – owned and operated by corrupting corporate money – call the shots, while the public interest is further betrayed. Barefoot Accountant: It’s unfortunate that it becomes so difficult and expensive for a third-party candidate to get the exposure and to even get on the ballot. I suspect that other third party candidates are experiencing that difficulty besides you. I recently saw the interview of Ralph Nader’s endorsement of you, which was on April 17th. Brian Montpoli of CBS News, a political reporter, hosted Ralph Nader on his show. And Ralph gave you a glowing endorsement. I was very impressed by that. He called you very, very progressive: that you had a very, very progressive record. Of course, he mentioned your two terms as the mayor of Salt Lake City. But he also pointed out that your background includes that being a Constitutional attorney and a civil rights lawyer, which I was very pleased to hear and to learn. And he gave examples of your progressive positions: about public financing, about the minimum wage, cutting the defense budget by at least 50%, and the environment, and so on and so forth. Can you iterate your major positions and how they contrast to those of the Democratic and Republican candidates? Rocky Anderson: First of all, I was very appreciative of Ralph’s support of me. He never uses the word endorsement; he makes a point about that. I think the word support is better because he does not want to defend what something that I might say or do and have people say that he endorsed it. I think that he and I see things through very similar lens. And that is, that our government should be acting on behalf of we, the people, and not be sold out to those who simply have the money to buy and pay for these politicians in Washington. So much of the failure in public policy that we talk about is due to that corrupting influence of money. You only have to follow the money to see why it is that we have so many public policy disasters, both emanating from the White House and the United States Congress. Let’s take the biggest disaster that’s looming, and that is the failure of the United States to provide the essential international leadership on climate change. There is only one reason that we are not doing the right thing given the state of knowledge in the scientific community, near unanimity, probably 96%, 97%, of scientists in agreement about the scope of the problem with climate change; the causes, the human causes of climate change, primarily the burning of fossil fuels and the destruction of forests; what can be done about it; what we are going to see in the future, the catastrophic consequences of climate disruption if we don’t take action now. And people in the future are going to look back and say, why didn’t they, based on the knowledge that they had take responsible action to save us from these cataclysmic consequences? And I think the clear answer is the people in our political system have been bought off primarily by the fossil fuel industries, the coal, oil, and gas companies, and that’s why they haven’t acted in the interest us, the future generations, and the world’s inhabitants everywhere now and far into the future. Same thing with health care. Bill, we’re the only country in the entire developed world that doesn’t provide essential health care for all citizens. It’s immoral. It’s politically incredible that we haven’t reached the point that every other industrialized nation has reached. They may go about it different ways, but not one of them rely upon for-profit insurance companies for the provision of basic healthcare. But we could we do in this country and it’s gotten so bad that when President Obama pledged to fix the system, he’s sold out entirely, as did Congress, to the for-profit insurance companies as well as to the pharmaceutical industry and that’s why our premiums continue to go up. That’s why we have still the health care system that’s more than twice as expensive as the average among the industrialized world, and why even if the Obama health care plan is fully implemented, twenty three million Americans still will be without basic health care. Follow the money. That’s why we are in the bind that we are in here in the United States today. Barefoot Accountant: Rocky, if you were President and you had the backing of Congress, what system would you have proposed? I was very disappointed, you know, in 2008, I believed in President Obama when he said “change you can believe in”, “hope and change”, “change the way Washington works”. And I started to become very disenchanted starting in the spring of 2009, and then progressively it deteriorated. And I love your quote that I guess you uttered sometime in two thousand eleven when you left the Democratic party. And I think I beat you to that: I registered as an Independent before you did. I expected President Obama to at least propose the public option; and he never proposed it! And I thought that was unconscionable. Ideally I would have proposed the single-payer system because I think probably that would be the most effective. But I’d like to hear what you would have proposed if you had—let’s just say you had the backing of Congress, and by the way he had, I think, fifty nine, sixty, votes in the Senate: he had the Congress in two thousand and nine. So what would you have proposed, Rocky? Rocky Anderson: I would have proposed what the majority of the American people wanted, and that is the single-payer, Medicare-for-all system, so that you take out all of the profits that are going to the insurance companies, their marketing costs, payment of people to sit around in offices and try to figure out how to deprive us of coverage for insurance for which we paid outrageous premiums. This is what the American people want, and there is very good reason for it. Single-payer systems have been incredibly successful in those countries where they’ve been implemented. But even multiple payer systems where they have been nonprofit insurers, like in Germany, it works out very well there as in Italy. Canada’s system, Taiwan’s system, they are single-payer systems: that’s what we need in this country because if we have those multiple payer systems I think you would see the same kind of corruption in Washington lead us to a far less efficient system. And we have a single-payer system but it only applies to people above a certain age and that system is Medicare. We also have a socialized system in this country: it’s called the VA hospital, where not only the payer is the government but also the medical facilities belong to the government and those who work there are employed by the government. And the VA hospital has had some problems in the past but actually in terms of the quality of medical care, it’s ranked, I read recently, even above the Mayo Clinic for excellence in the services provided. So there are different ways of getting there but I think very clearly the single-payer Medicare-for-all system is where we ought to be. Now President Obama promised a lot of things during his campaign, and I know that there a lot of people that wanted to believe. I frankly warned people that they were going to be vastly disappointed because I saw all sorts of signs even leading up to the election. President Obama promising us that he would join a filibuster when he was in the United States Senate and help block proposed legislation that would provide retroactive criminal immunity for telecommunication companies for their involvement in the illegal surveillance of American citizens communications. And then as soon as then Senator Obama won the Democratic nomination, he turned one hundred and eighty degrees and voted in favor of that legislation. And that’s after three telecommunication companies spent twelve million dollars during a three-month period of time for its lobbying blitz. Now how many of us get to commit federal felonies and go to Congress and get Congress to say, “oh, never mind, we will grant you retroactive immunity under the law.” That’s the kind of two-tiered system we have in this country: two-tiered system of justice. We’re supposed to be a people who believe in liberty and justice for all and yet it really is a system where the system of justice is different depending on how powerful you are and how wealthy you are. So President Obama showed his stripes even before he was elected. He voted for full funding for the illegal occupation of Iraq when he was in the United States Senate. He was in the hip pocket of the nuclear power industry when he was in the Illinois legislature. So when we started moving into that health care debate and he wouldn’t even put universal single-payer healthcare on the table, it didn’t come as much of a surprise that then he would back off on the notion of a public option. But what really surprised even me is how timid he was, how quickly he took that option off the table. It’s almost like all the Republicans had to do was snarl a little bit and say that they were going to oppose public option and he came out, I’ll never forget his words, “Well a public option isn’t essential for health care reform.” That’s what he said. You know, at that, the insurance companies looked at it and they must have just been skipping all the way to the bank after that because now we got a system where the government purports to be able to tell everyone of us that we have to buy this perverse product from for-profit insurance companies. Barefoot Accountant: Amazing. By the way, Glenn Greenwald wrote an excellent book, “With Liberty and Justice for Some”. Perhaps you’ve read it. Is that why you chose the name for your party, Justice Party? Barefoot Accountant: Why did you choose the name, justice, for the name of your party, the Justice Party? Rocky Anderson: Because it connotes fairness and equity. We talk about economic justice, social justice, and environmental justice. And I think that the word justice captures perfectly well what it is that we are pursuing as the Justice Party and what I am talking about throughout this entire campaign. There is no justice in a nation where we have the greatest economic disparity in terms of both wealth and income than at any time since the 1920s. Think about the massive increase in wealth during the past decade, more than decade, when there has been such great economic growth and yet stagnant wages for working men and women and their families. We built up a very healthy, thriving middle class after World War II. There was fairness in taxation: the wealthy were finally paying their fair share; it may have even gotten to the point where they were paying more than their fair share at least in the highest income tax brackets. But now it’s just amazing to me that for the first time in our nation’s history that we could have been fighting two wars and charging it to our children. And at the same time, not just failing to pay as we went along and raising the revenues but actually giving massive tax cuts to the wealthy. These tax cuts, if they continue, are going to cost our nation trillions of dollars. And we’re not looking out for those who come after us. We’re not really interested in reducing our debt when we turn a blind eye to the revenue side of our budget. Sure, there are cuts that can be made. But it takes both. You know, if you run up your family credit card, you just don’t just say, “well, we’ll start spending less.” You’re going to have to go out and bring in more revenues to get it paid off and pay off the interest. But we are wasting so much money in interest payments on this outrageous accumulated debt in the neighborhood of $16 trillion right now. We pay every year as much in interest on that debt as we spend on twelve departments of the United States government. And that just screams out lost opportunities. And it also screams out that we really are mortgaging much of the future of later generations. And at the same time with the baby boom generation now moving into retirement, fewer of us in the workforce, and not altering social security, we ought to be means testing it so that the wealthy who don’t need it aren’t going to be drawing off of it. At least it ought to be staged in over time, a means testing. But we also have a cap on the payroll taxes for social security. So those who make over $110,000 a year are paying much less of their income as a percentage of income than what the rest of us are paying. There is no equity in that. There’s no justice in that. So that’s just one example, of course, and we could go on all day long to point out the injustices. But at the core of this, at the very root of it, is our system of government that has become so corrupted by money that nobody questions anymore on the right, the left, the middle, nobody wonders anymore why it is that Congress and the White House do or fail to do what they do because of the impact of money. Barefoot Accountant: By the way, I agree with you 100% that the $110,100 cap on social security saves Mitt Romney 12.2% in taxes every year. And the reports are saying that in 2036 we are going to have a shortfall in social security and that we will only be meeting the obligations of 75%. That could easily be rectified by uncapping or raising the social security limit. I find it unconscionable that Warren Buffet and others are only taxed at 11%. When you and I have our own business, we are paying 15.3% in employment taxes right there plus we are paying federal income taxes, and we don’t get that capital gains tax break of 15%, which is ridiculous. Also Congress voted down a House Bill, in fact, Chris Murphy, who is running as a Democrat for the U.S. Senate from Connecticut, also voted down that same House Bill, that would have tax “carried interest” not at capital gains rates. In other words, hedge fund managers, and investment CEOs are being taxed at 15% instead of 35%, what most Americans are being taxed at. That is egregious. By the way, I am a little bit older than you: I was born in 1948. And I remember the highest marginal tax rate being 91%. When JFK became President, and then Lyndon Johnson, that rate came down to about, I think it was 77%. And we had a great boom. And he also introduced the investment tax credit an when the capital gains tax rate came into effect, I’m recalling this from memory as a child, but I think the capital gains tax break was half of the capital gains was not taxable and the other half was taxable at ordinary income tax rates, not 15%, but as high as 77%. I saw a major change in tax policy and in the Democratic Party beginning around 1980. I was at Purdue University, and I was in a strategic management class, and I was the only one who saw major corporations, large conglomerates, as something to be concerned about: everyone was for it. Here were all your future MBA people that were buying into this big phenomenon, ignoring the Sherman Anti-Trust Act. I never hear that mentioned except from Ralph Nader and a few others. In 1980 when Ronald Reagan came in, he lowered the highest marginal tax rate in the Tax Reform Act of 1986. Then George Bush came in and raised it up, but I just saw a major change occurring in America and since nineteen eighty, as you mentioned, the greatest transfer of wealth occurred: the elite class increased their wealth by over four hundred percent while for 99% of Americans, their wealth has declined. So a lot of this has occurred because of the change in the tax policy, empirically if you look at the evidence. Rocky Anderson: And a lot of it is because of the Democrats back then, but did you hear about Nancy Pelosi’s latest proposal—illustrating what the Democratic leadership in Congress has become—that she’s proposing now that instead of eliminating the budget-busting Bush tax cuts for those who make over two hundred fifty thousand dollars, she is suggesting that the tax cuts be eliminated only for those who make over a million dollars a year. Barefoot Accountant: Well I think Obama even suggested that before her, too, right? Wasn’t that Obama’s proposal, too? Rocky Anderson: No, he has been talking about two hundred and fifty thousand dollars. He apparently lacks entirely the capacity to go out and make his case to the American people so that they’ll push Congress to do the right thing. And so now what do we see from the Democrats? Moving up the two hundred fifty thousand dollar mark and allowing the Bush tax cuts to remain for everyone up to a million dollars. That’s unconscionable. That’s telling our young people that we really don’t care about shouldering you with this enormous debt and the interest burden that they’re going to be shouldering. It’s saying that we’re not really serious about cutting our deficits, about getting a handle on our nation’s debt. And it’s telling working class people that there’s not a party anymore that’s really looking out for you. Now those Bush tax cuts were to have expired. That was the promise made to the American people. Now the Republicans forced President Obama—but it’s not a force that I think he couldn’t have dealt with if he had anything in him to do it—he promised during his campaign to do it. He caved on those just like he caved on the public auction for health care. And now they’re actually talking about caving on not letting them expire except for those who make more than a million dollars a year. People in this country, the middle class, should dismiss him completely out of town and say, you know, you are just trying to out Republican the Republicans. We are not going to put up with it anymore, they ought to tell the Democrats generally, and we all need to come together and change the system. And that’s why we formed the Justice Party, and it’s time to act. You know, we watched people throughout the Arab world stand up against their dictators. It’s time that we, the American people, shrugged off our complacency, stood up, took a stand, and said, we’re not going to fall for this lesser of two evils nonsense anymore. This nonsense about spoiling the election. We are all going to assert ourselves, we’re going to draw the line saying we’re not going to put up with this anymore. We are going to support in different parties, support different candidates, and never again fall for this duopoly of the Republican and Democratic parties who profit so much from the corruption of our government. Barefoot Accountant: By the way, I noticed a change in the Democratic Party up when bill Clinton was in office. You know, Alan Greenspan was hailed as the greatest Federal Reserve Chairman since the birth of the nation and he surrounded himself with Wall Streeters. A lot of changes occurred on Wall Street under Bill Clinton’s watch. Rocky Anderson. Well, he got rid of the Glass-Steagall Act in 1999. Alan Greenspan actually even with Glass-Steagall in place had allowed the merger of an insurance company, an investment bank, and and a commercial bank. He found a way to do that and then Bill Clinton basically said, and Congress said, well, we might as well open it up for everybody. Unbelievable that they would that they would let things get set up for this kind of economic disaster we faced. And now it’s more and more deregulation. You know, Bill, my problem isn’t so much with the greed on Wall Street because we expect people to be greedy on Wall Street. And except for the massive fraud that took place, and every one of them that engaged in that ought to be held accountable, but they never will because Wall Street contributed so much to President Obama’s campaign and he surrounded himself with so many of these people, who would expect that they would ever prosecute anybody for their illegal conduct. Again it is this two-tiered system of justice that we have. But when Congress and the regulators have deregulated to the point that these folks were able to engage in this reckless speculation and putting these fraudulent products on the market, these derivatives, putting these toxic mortgages together, and then selling them as if they were triple A rated securities. And you know who bought them? And it wasn’t just other banks; it was pension funds, working men and women retirement funds that were buying these products and now have suffered such a tremendous loss: on average around the country, one third of the value being lost. So all anybody needs to do is look at their 401(K) plan or their pension plan and see the losses from two thousand eight forward. We need to hold accountable all those who helped paved the way. And then President Obama, who comes along after the fact and surrounds himself with the same people who helped pave the way toward deregulation, you just got to shake your head and say, why I do we ever put up with this? Isn’t there a point at which we’re going to say, we are drawing the line and we will never vote for a Republican or a Democrat when they have led us to this point of disaster. And then, we have not even started talking about the imperial presidency and the destruction…I usually don’t stutter but I get so upset about this, being a lawyer, somebody who values our constitution, somebody who has always looked at our nation as being, at least aspiring to be so great and providing liberties and civil rights and human rights in a way that so few countries have ever aspired to do; and then to see the ratcheting up of the imperial presidency, Congress standing by allowing this to happen; and President Bush and now President Obama gathering to themselves so much power that was never contemplated under the Constitution even to the point of asserting the right to indefinitely detain up to somebody’s lifetime, even US citizens without charges, without trial, without legal representation, without the right of habeas corpus: it is absolutely subversive, it is anti-American. And we shouldn’t as a people ever allow that to happen. But what happens? You get a Democrat to do it, somebody like President Obama, a President who we saw from the New York Times article today is approving, personally approving, the unmanned drone strikes that have killed so many innocent bystanders in countries where Congress has never authorized these acts of war, completely in derogation of the Constitution’s war power clause. We stand by and watch this happen in our country? Congress allows this intrusion on the powers that belong to it, including the sole perogative to declare war? And then when somebody challenges these abuses to our Constitution, the very perpetrators of these offenses, the executive branch, goes into the courts and say, you can’t move forward with this case because to do so would mean the disclosure of important state secrets. And so the courts say, “okay, case dismissed”. So now we have no checks and balances in our system. Bill, that is the very definition of tyranny. And we, the American people, owe it to ourselves, to our nation, to those who come along in the future, to stand up and not allow this to happen any further because up until twelve years, although we had our failings as a nation, we always aspired to those values that we’ve seen our generation seems to be okay about just letting go. Where are the lawyers? Barefoot Accountant: By the way, there was not one Democrat challenging President Obama in a primary especially with this tyranny occurring. You know, I hope I am not guilty of committing Gowdin’s Law here, but you look in history, history repeats itself. You know, I saw Mein Kempf: my parents brought me to that movie when I was a child and we watched it, and I wondered how a whole race, German people, could allow this to happen. And now I see what’s happening in our country. And it’s almost like there is a complacency brought about via the media. Joseph Goebbels, radio was very influential in Germany, Joseph Goebbels…Adolf Hitler was famous for saying, if you repeat a lie often enough, it becomes credible. And Joseph Goebbels took that statement one step further and said, the bigger the lie, the more credible it becomes. And I look at our country now with the media and I guess I see a parallel here that the American people have become so complacent about our aggression overseas without an act of war. And even our Congress, I do not see, except for Bernie Sanders and maybe Ron Paul, but I don’t see people coming up and really challenging, you know, this sort of aggression against other countries. And we have been doing it now for twenty years, at least, if not longer. Rocky Anderson: Yeah uh… and it’s often hard to make Nazi analogies without having them dismissed out of hand but I think the point is a really important one. Eugene Ionesco in his play, Rhinoceros, there was an allegory about the rise of fascism in Europe and people were just making all sorts of excuses why they shouldn’t get involved, why they shouldn’t stand-up and speak out against what they saw happen. And we see the same thing in this country. People say, uh, it’s none of my business, or it’s so complicated and these people must really know what they’re doing. Well they don’t. They may know some things that are not disclosed to us because it has become such a secretive government but the fact remains we have people playing with joysticks with unmanned drones in Somalia, in Pakistan, even still flying over Iraq, even though we say we’ve taken our troops out, we still have unmanned drones there, in Yemen, and when we attack people there, we are taking them out left and right, there are also innocent people being killed. And then we wonder why are we less secure, why are those people so angry with us. We have made Pakistan absolutely furious toward the United States. We’ve created such insecurity for the Pakistani government and created so much anger among the Pakistani people. Remember they are a nuclear power. Can you imagine al-Qaeda, or the Pakistani Taliban taking power in Pakistan because through our atrocities we’ve made the people so furious with the United States, and with any government that we might be helping out there? As bad as our conduct has been toward others and other countries, even if we were simply to consider our own security, our own well being and the well being of those who come after us in our country, what we’re doing is so self-destructive. And we, the American people, can’t remain complacent anymore. We’ve got to stand up against this. And certainly we’ve got to stand up when we see the President claiming the power to indefinitely detain even US citizens. Is this Gulag America now for government can actually, agents of the government, has just come to your home, grab you up in the middle of the night, disappear you, put you in a military prison, your family not even know where you are, not provided any legal representation, not allowing independent forum for you to go to, to have somebody independently determine the lawfulness of your detention, and no trial and no charges? This is unprecedented, Bill, in this country. And, again, it is not to say we have not had our problems in the past, but we’ve always aspired to much greater. You know, after the abuses by the intelligence community during the Cold War, Congress, both Houses of Congress, had investigated committees, in the Senate it was the Church Committee. Even President Ford appointed the Rockefeller Commission to look into these abuses. And they were disclosed. We found out about the abuses by the FBI, by the CIA. There was legislation passed to try to make certain that these abuses didn’t happen in the future. Now the message by just about everybody in Congress and certainly by our President and his administration is let’s just sweep it all under the rug. No accountability, we are just going to look forward and not backwards. No accountability for illegal surveillance of our communications, no accountability for war crimes, and if somebody challenges them in the courts, we’re going to make certain that the courts no longer provide a check on those abuses of executive power. Again, it is absolutely subversive to our Constitution, subversive to the values that our country and its people have held since the very founding; it’s subversive to the rule of law. And without the rule of law, without one system of justice where nobody is above the law, we are living under a tyranny and it is getting worse. I’m not an alarmist; I’m not exaggerating the situation. This is where things stand right now. And I would urge every American who values these long held values—the rule of law, our Constitution, due process, equal protection of the law, the principle that everybody is accountable under the law, and checks and balances among three the co-equal branches of government—all of us who believe in those values have got to take a stand and say, “no more”. And the best time to do that is during an election, where we send a message that we, the American people, are not going to put up with it anymore. Barefoot Accountant: Now, Rocky, you mentioned the woman’s suffrage movement, the civil rights, and there was a third one, Egypt, three instances where you can bring about change. There was also the Vietnam war movement. I was very active in that as well. I worked on Eugene McCarthy’s campaign in nineteen sixty eight. That was before your time. Rocky Anderson: Oh, no, I knew Gene McCarthy well. Barefoot Accountant: I collected the most signatures to get him on the ballot here in Connecticut so I had the honor of meeting him in New York. But what can the American people do now? I know the occupiers, I applaud them for what they are doing…. Rocky Anderson: I do, too. Barefoot Accountant: What can the average American do now? I mean, I know we have to get you on the ballot in fifty states. I know here in Connecticut we have to get seventy five hundred signatures by August sixth to get you on the ballot. So let’s talk about what we need to do, what we can do as members of the Justice Party and as concerned citizens. What specifically would you suggest to the American people? Rocky Anderson: Bill, there is not any one magic bullet. I think involvement in the electoral system is absolutely crucial. I totally disagree with those who say, well it’s broken and it’s so corrupt. In addition to that we all need to work outside the electoral system as well. We need to take to the streets, we need to support the occupy movement. And that is not just a matter of taking some food over to those who are occupying; it’s getting involved, showing by numbers the American people have absolutely had it. You know the occupy movement is supposed to be about the nintety-nine percent, it’s not just supposed to be about a few thousand people that are out there occupying. But it’s about all of us who have common interests and common concerns. And I wouldn’t keep out the one-percent either. There are plenty of people in the one percent that believe in these shared American values. Yeah, you go back to the anti-slavery movement, the women’s suffrage movement, the civil rights movement, the anti-war movement, the labor movement: they all were successful. They started in the streets. They were all successful because people at the grassroots kept up the fight. They had it in them to carry on a sustained battle for what was right. And we need to be able to do that in this country. It’s not a one time deal. It’s not showing up at a demonstration, going back to sleep for six months. So doing everything we can. Showing up whenever there is any kind of public forum, demonstration, or rally, an occupy event, showing up when our elected officials show up. You know, it is becoming more and more the trend as it is in Salt Lake City with our supposed—he calls himself a democrat but I think that’s a joke, that our Congressman, they call themselves blue-dog democrats, I call them yellow-bellied democrats— he doesn’t show up for public meetings any more. He holds town halls over the telephone, highly scripted, they’ve got the questions that are going to be asked. This is a Congressional representative and he’s been doing this now for years. Absolutely shameful. Yet why we the people, when these folks are working for us, ever cast a vote for them again is beyond me. It shows the timidity of the American people in large part as well. So I just say we’ve got to do everything we can. Express our points-of-view, let our elected officials know there will be a political price paid if they don’t do what we do demand of them. If our elected representatives are voting to continue the Bush tax cuts for those who are making over two hundred fifty thousand dollars a year, we need to tell them they will never ever have our vote again. Barefoot Accountant: Well, we don’t have choices given the fact that we have a republican and a democratic party where essentially they are the same on many of the foreign and economic policies—one is just a little bit more liberal on social policies. I think that’s why fifty percent of the electorate does not vote. And also people are so discouraged. As you said they feel that the system is broken beyond repair. Rocky Anderson: I think that the electoral college also contributes to that. Barefoot Accountant: Yeah, and I do think that we have a totalitarian corporate state, a dictatorship as you said. How can we work within the system now: all right support candidates such as yourself, take to the streets, anything else? You inspired me. When I heard you last December, you know, on Cenk’s show, you offered hope. And you were talking about this about this, about if Egypt can do it, so can we. Rocky Anderson: Look at social media. The opportunities we have to spread the word. We will put out things and when I see a few dozen people share the messages, and all you have to do is make a couple of clicks, type in a few words maybe. We’ve got to rise to the occasion. Just in the back of our minds we have got to keep that little voice going: do more; take every opportunity you have; write letters to the editor; show up at town meetings; let officials know that they are never going to have your support again when they act against the public interest. This is supposed to be government of, by and for the people and instead it’s government of, by, and for the very wealthiest of corporate interest who have been buying their way in Washington DC for far too long. And that’s having a real impact, not only on we, the American people, but on people all over the world. Barefoot Accountant: You are on the Justice party. Are you different on on certain issues from the Green party? Rocky Anderson: You know I think the Green party has had a tough history. They’ve been around for over ten years; no major electoral successes. I respect what they’re doing. I respect their positions. I got to know Jill Stein a little bit. I think she’s a really great woman, and a very good candidate for the Green party. I admire what they’re doing. I’d like to see us all come together. I really feel strongly that we can’t see ourselves as just simply liberals or conservatives anymore in this country. We have so many things that ought to be unifying us and we need a broad based approach. Maybe I’m naive about this but it seems to me on the most fundamental kinds of issues we can bring all sorts of people together, who say, okay we’ve got these differences; we’re not going to be so doctrinaire about it; we can hash out those differences down the road: but when it comes to getting rid of the corrupting influence money, restoring our democracy, restoring the rule of law, ending these wars, ending this pattern of wars of aggression. Well you know, you talked about Nazi Germany before. Wars of aggression which are wars where you attack a country that doesn’t pose any imminent danger to you, it’s the very definition of our war against Iraq: it was clearly an illegal war of aggression completely illegal under the UN charter and under the Kellogg Briand Pact. But it was wars of aggression that were prosecuted for which people were convicted at Nuremberg. This entry was posted in Accountants CPA Hartford, Articles and tagged Barefoot Accountant's livestream internet program on taxes and U.S. politics, Glenn Greenwald, http://www.cpa-connecticut.com/livestream.html, Justice Party, Presidential Candidate, public option, Rocky Anderson, Single-payer healthcare system, The Barefoot Accountant Interview of Rocky Anderson May 29 2012, video transcript, With Liberty and Justice for Some. Bookmark the permalink. Excellent, informative interview. I first came across Rocky Anderson on democracynow.org. He is my candidate for President in 2012. Excellent program, Democracy Now: objective news program, unlike the corporate owned media giants. I deeply appreciate your comment. Rocky Anderson is my candidate for President in 2012. Romney and Obama are bought and paid for by Corporate America. Let’s hope more Americans become aware of this sad reality. Rocky, 9/11 was an inside job. That means George Bush targeted American citizens for assassination and got away with it. I’d like to support you, but as long as you believe so many of the Big Lies, like 9/11 was caused by terrorists, it just isn’t working for me. Aas an aside- the article you posted on firedoglake- your comment about how FDL does not allow articles for opponents to Obama is what got me banned from FDL. Or more like- it was the excuse that was used to get me banned. We plan to promote it all over the country.